Jesus lived a lifetime in the looming shadow of the cross. He was conceived for Calvary, born to die, begotten for burial and reared for the resurrection. He spent three decades on death row. He was aware of the agony that awaited His body and the anguish that would tear His heart. We are largely left in the dark concerning His early years. At what point He knew who He was, we do not know, but it must have been early. Mary pondered the things concerning His remarkable birth and early days in her heart (Luke 2:19) and, without doubt, shared them with Him (cf. Luke 2:40). By the age twelve He was “about His father’s business” (Luke 12:49). He grew up reading the prophecies about Himself. He saw His sacrifice implied (Genesis 4:3-5), prophesied (Genesis 22:8), typified (Exodus 12:5) and personified (Isaiah 53:7). On earth, He was identified by John (John 1:29) and verified by the apostles (Acts 8:30-35). Presently He is glorified in heaven (Revelation 5:12-13). What was it like to grow up in the shadow of the cross? He was not isolated or sheltered from events that depicted His own future. Gary Stanley has recreated what might have happened in “An Imaginary Conversation Between a Boy and Centurion Soldier” (edited). The legionnaire leaned against his spear to study the boy standing at the base of the cross. The old soldier had handled hundreds of crucifixions, and this one was no different. Every crucifixion had its victim. Every crucifixion had its Roman sanction. Every crucifixion had its audience. The guard was a seasoned student of the expression on each spectator’s face. Most feigned disgust and clucked useless sympathies, but their eyes betrayed a morbid fascination. As the day wore on, spectators came and went, but their eyes always seemed the same. By the evening meal only the boy remained. He stood quite still, a bundle of wood at his feet. The guard recognized him; he was a tradesman’s son and often travelled the streets making deliveries for his father. Jesus read His own obituary (Isaiah 53). He knew He would be pierced (Psalms 22:16; Zechariah 12:10) and hanged on a tree (Deuteronomy 21:23). He learned of the thirst involved (Psalms 69:21) and the failing of His strength (Psalms 109:4; Isaiah 53:12). He knew He would be betrayed (Psalms 41:9; 55:12-14) and forsaken by His own (Zechariah 13:7). Christ grew up reading about Abraham sparing Isaac but knew that His Father would not stop the “knife from falling” on Him (Genesis 22). He studied the Passover lamb (Exodus 12) and knew that He was the substance of that shadow (John 1:29). He went to offer His sacrifices and knew that each one was but a figure of His bleeding wounds (cf. Leviticus 1-5; John 3:14-16). What must He have thought when He first saw a soldier draw back a whip! He knew that His back would one day be bared to the same “cat-of-nine-tails.” When He heard the moans of agony and saw the blood pour from the wounds, He was looking into His mirrored future. When He heard the crowd’s mockery, He knew He would feel the sting of insult. He must have dreaded being smitten, spat on (Isaiah 50:6), wounded, bruised, and stripped (Isaiah 53:5). Later, He ended every funeral He attended (Luke 7:11-15; John 11:43). But, suppose He attended one as a boy. What must have gone through His mind, knowing that He would prematurely die and be laid in a borrowed tomb? He knew that they would be unable to get a big enough rock to keep Him in the grave! He had read that He would be buried with the rich (Isaiah 53:9), but also that His soul would not be left in Hades (Psalms 16:8-10). He knew that He resurrected (cf. John 2:19), ascended (Psalms 68:18; 110:1), anointed (Psalms 45:6-7), and enthroned (2 Samuel 7:12-13). Have you obeyed King Jesus? He asks that you believe that He is the Son of God (John 3:16), turn away from your sins in repentance (Luke 13:3), confess His deity (Matthew 10:32), be buried in baptism for the remission of sins (Acts 2:38), and live faithfully till death (Revelation 2:10); Titus 2:12)? Jesus lived in the shadow of the cross, that we might live in the shadow of heaven! Categories: Repentance, Salvation | Tags: Allen Webster, Consequence of sin, Repentance, Salvation | Permalink. What is there that could be written about Jesus that has not been written about Him? As we sing, “He is my everything!” When it comes to our atonement, He is our High Priest, our Sacrificial Lamb, and, even the Altar on which sacrifices are made. Jesus, my High Priest, makes intercession to God for me (Hebrews 7:25). A priest is on who is duly authorized to minister in sacred things, particularly to offer sacrifices at the altar, and who acts as mediator between men and God (Exodus 28:29) (ISB). More specifically, a priest’s job consisted in offering gifts and sacrifices (Hebrews 5:1), making atonement (Leviticus 16:1-34), inquiring of God (1 Samuel 23:9-12), leading in the selection and ordaining of religious and civil leaders (Numbers 8:11-21; 1 Kings 1:34), blessing the people (Numbers 6:22-27), and teaching the law (Nehemiah 8:1-8). Jesus offered a sacrifice to God, made atonement for sinners, revealed God to men (John 14:7), selected the apostles who still serve as leaders in His church (Ephesians 2:20), blessed mankind with an opportunity of salvation (Matthew. 11:28-30), and taught men the Law of God (John 6:44-45). There were two priesthoods in the Old Testament: Melchisedec’s and Aaron’s. Jesus is a Priest after the order of Melchisedec because He will never be replaced (Hebrews 6:20). Jesus is a compassionate High Priest. “For we have not an high priest which cannot be touched with the feeling of our infirmities; but was in all points tempted like as we are, yet without sin” (Hebrews 4:15). Because He is “on our side” we can come boldly to God’s throne to find help in time of need (Hebrews 4:16). Just as a priest could marry only a virgin in Israel (Leviticus 2:14), Jesus took a pure virgin unto Himself (the church) (Ephesians 5:27; 2 Corinthians 11:2). A priest could have no physical defects (Leviticus 21:16-23), and Jesus had no spiritual defects (Hebrews 4:15). He is the perfect High Priest. Jesus, the Lamb of God, offered Himself as my sacrifice. Jesus was predicted to be a “lamb dumb (silent) before His shearers” (Isaiah 53:7), presented to Israel as the “Lamb of God” (John 1:29), preached to the world as the sacrificed Lamb (Acts 8:32-35), and will be praised throughout all eternity as the Lamb that was slain and lives again (Revelation 5:6, 13). Words cannot express the agony that this Lamb suffered during the process of offering Himself to God. A Levitical lamb suffered, but only briefly and only physically. 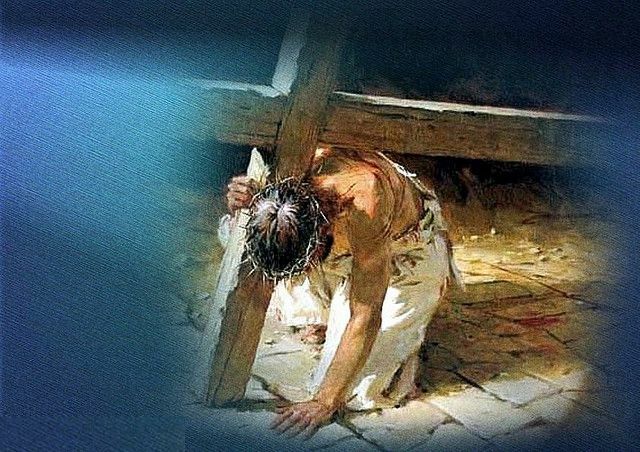 Jesus suffered for twenty-four or more hours. His worst suffering may have been the emotional anguish. He was separated from His Father for the first time (Mark 15:34). He reached the point where He prayed so earnestly that His sweat was a great drops of blood falling to the ground (Luke 22:44). He was mocked, beaten, slapped, humiliated, nailed, and suffocated (the normal cause for death by crucifixion). His body was pierced with a spear. He took my place as the Lamb to pay the price for my sins (Ephesians 1:7). May we never tire of praising His name for the sacrifice He made for us. Jesus, the Altar, is where mercy is received (Hebrews 9:5). The Old Testament ark of the covenant was covered with a mercy seat on which blood was sprinkled by the high priest on the great Day of Atonement. This effected reconciliation between God and His people. Just as the high priest once a year took the blood of the sin offering and sprinkled it on the mercy seat in the Holy of Holies, so Christ as our great High Priest took His own blood to cover our sins. Categories: Salvation | Tags: Allen Webster, Sacrifice, Salvation | Permalink.